A brand new Joomla 1.5 template on the two basic branches of hospitality industry – accommodation and restaurants, will soon be available for free download on ThemZa.com. The Hotel and Restaurant theme offers all the visual elements and navigation functionalities to present your accommodation, dining and spa services in a most attractive way. Your tempting offers and seasonal promotions will be a click away from your customers. The template offers a 3-column layout and supports a rich set of custom layout options including a choice of colors (blue, green & red), an editable logo area, a dynamic banner area, etc. 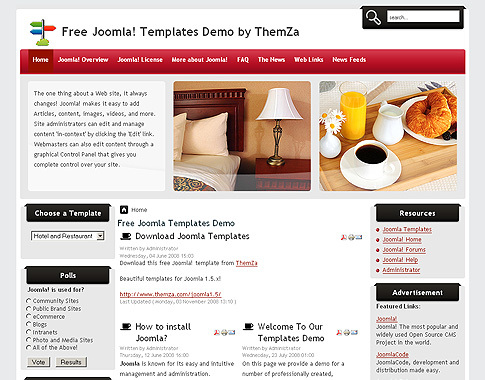 This entry was posted on Friday, February 18th, 2011 at 6:09 am	and is filed under Joomla 1.5.x. You can follow any responses to this entry through the RSS 2.0 feed. You can leave a response, or trackback from your own site.